The Gray Court-Owings Historical Society was organized in February, 2001 with fourteen dedicated members and has grown to thirty members. It was founded to preserve the history and historic structures of this small rural area. The two small towns of Gray Court and Owings grew up around the railroad to serve the small farming communities nearby. The first European settler in the area was Richard Owings III who brought his family from Owings Mill, Maryland about 1757. His son Richard Owings IV was a patriot in the Revolution. The area has much historic value and as yet luckily has evaded the swath of the bulldozer and development. The towns consist of old homes and buildings and there is beautiful farmland outside the town limits. The society has sponsored a 100-year school reunion, published a 214 page pictorial history of the area, nominated Owings Station and Gray Court-Owings School to the National Register, sponsored Pioneer Day (a festival), established a museum, and is building a pioneer homestead, the Culbertson Back Country Settlement. 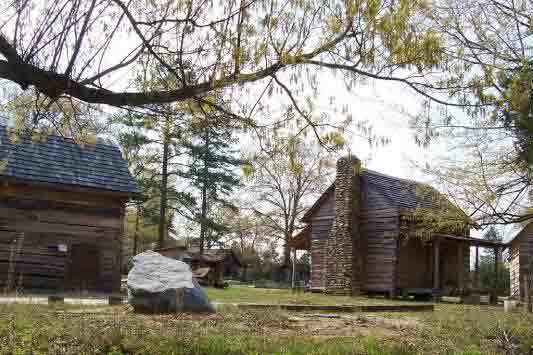 The Culbertson Back Country Settlement is on a beautiful two-acre circle on the old Georgia Road in Gray Court, just in front of the old Gray Court cemetery on the hill. The road was an old wagon road to Georgia that once was traveled by stagecoach to the Dorroh Inn just down the road. The Settlement consists of two log cabins, a block house, a one-room African-American school, corn crib, 1882 church, and a blacksmith shop. All of these structures have been given to the society and were in need of rescue. Most of what has been done to date has been done by volunteer work and donations of members but to complete these wonderful dreams additional funds will be required. The society would be most appreciative of help to preserve these wonderful examples of early American life so that they may be used to educate people today of our great heritage.